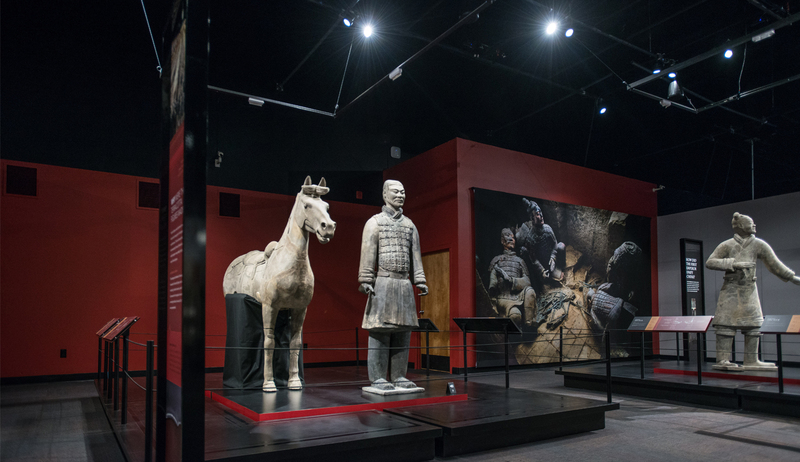 An individual who can only be described as a complete dumbass has been busted by the FBI for breaking the thumb off a Terracotta Warrior on display at the Franklin Institute in Philadelphia and hiding it in his desk drawer. It’s incalculably sad that this 24-year-old loser who still lives at home with Mommy and Daddy was at the museum on the evening of December 21st just to attend an Ugly Sweater Party. He was able to access the room where 10 priceless terracotta warriors, among them the Cavalryman standing next to a horse, were on display simply by walking through a door carelessly left unlocked by (Keystone) rent-a-cops and stepping over the black rope capable of cordoning off nothing and nobody. He got a couple of his friends to join him, but they quickly left because they’re not complete dumbasses. He lingered a bit, looking at the statues with light from his cell, putting his arm around the Cavalryman and taking a selfie like an idiot. Then he deliberately with malice aforethought snapped off one of the statue’s thumbs and slipped it in his pocket before decamping. We know all this now because the FBI’s crack Art Crime squad reviewed security tape footage and saw it all go down. The museum staff only noticed the damage to the Cavalryman on January 8th, more than two weeks after it was looted. That’s when the FBI stepped in. FBI Special Agent Jacob Archer compared the surveillance footage to credit card receipts for the night and identified the thief as Michael Rohana of Bear, Delaware. When the agent showed up at the Rohana household, Michael folded like an origami crane. In front of his father, Rohana admitted it that he had stashed the thumb in his desk drawer. A U.S. attorney has decided to charge him with theft of a major artwork from a museum, concealment of major artwork stolen from a museum, and interstate transportation of stolen property. He was arrested and released on a 15,000-USD bail, on the condition that he hand over his passport, consent to drug testing, and refrain from leaving the country before trail. Meanwhile, the museum has reviewed its security systems and procedures in the wake of this debacle. The actions of one jackhole and the failure to follow any number of responsible security protocols shouldn’t irredeemably taint the exhibition. This particular group of warriors and artifacts have only been shown in two museums in the US. The first was the Pacific Science Center in Seattle, from which they all survived unscathed. The Franklin is the second and therefore the only one on the East Coast. 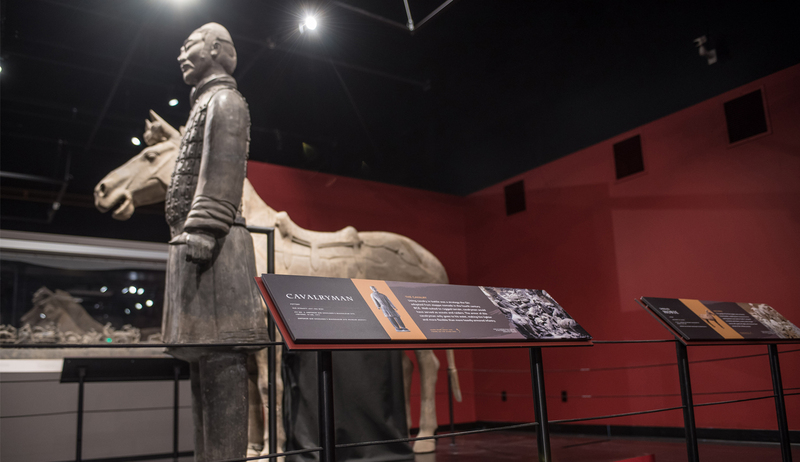 It’s the first time in 30 years that the City of Brotherly Love has had any Terracotta Warriors come stay for a while and given the colossal miscarriage of stewardship, it may be more than 30 years before they come back. Plus, they’ve created a nifty Augmented Reality app that allows visitors the chance to see the warriors in virtual close-up and to view them with digital versions of the original weapons and accessories that have long since been destroyed or lost. The Cavalryman would likely have held his horse’s reins in one hand and a spear in the other. The digital view includes those long-gone accoutrements. Terracotta Warriors of the First Emperor runs through March 4th of this year.